Karen E. Pointer has been a partner with Lerman & Pointer since 2000. Prior to forming Lerman & Pointer, Ms. Pointer practiced for several years in the employment law group of a preeminent full service law firm in Los Angeles. Ms. Pointer's expertise includes day-to-day counseling of clients with respect to hiring, promoting, discipline and termination, contract negotiations, wage and hour issues, leaves of absence, compliance with state and federal employment laws, and issues involving harassment, discrimination and wrongful termination. Ms. Pointer assists clients in the formulation, implementation and enforcement of employment policies and procedures, provides management training, and drafts a variety of employment-related agreements, including employment agreements, confidentiality and trade secret agreements, arbitration agreements and separation agreements. Preventive counseling is a key component of Ms. Pointer's practice. Ms. Pointer is admitted to practice before all California and federal courts. She is a member of Los Angeles County Bar Association, John M. Langston Bar Association, and Black Women Lawyers Association of Los Angeles, Inc. She has been a featured speaker at several professional seminars, including the Annual Meetings of the Labor & Employment Sections of the California State Bar and the Los Angeles County Bar Association, and the Southern California Employment Round Table. A native of Los Angeles, Karen E. Pointer also is involved in a variety of community activities, including PROTOTYPES, Centers for Innovation in Health, Mental Health and Social Services (Immediate Past Chair of the Board of Directors) and the Los Angeles Regional Food Bank (Board Director and Corporate Secretary). Ms. Pointer is also involved in a variety of charitable activities. She currently serves Chair of the Board of Directors of Boys & Girls Clubs of Metro Los Angeles, a collective of 5 clubs across Metro Los Angeles. She also serves on the Board of Directors of HealthRIGHT 360, a family of agencies including Prototypes, Walden House and Haight Ashbury Free Clinics. Ms. Pointer represents clients in a wide variety of industries in all aspects of employee/employer relations and employment law. 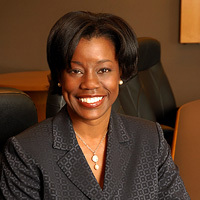 While Ms. Pointer has enjoyed a litigation practice focused primarily on employment matters, she also has significant experience in litigating a wide variety of business disputes. She represents clients through trial in state and federal courts, and before numerous public agencies, including California's Division of Labor Standards Enforcement, the federal Department of Labor's Wage and Hour Division, the Department of Fair Employment and Housing and the Equal Employment Opportunity Commission. Her clients range from individuals and small businesses to large corporations and educational institutions. Loyola Marymount University, B.S., Biology.